This bridge view kinda reminded me of Firenze, maybe it's the colors. You can see more pictures here. 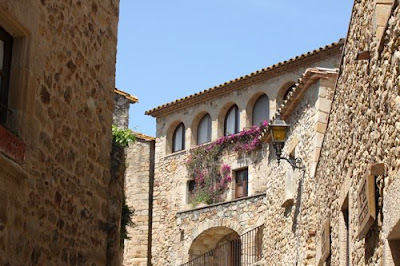 After Girona, we went to Pals. The road was so quiet on our way there and even in the town. It was so quiet and we hardly saw any people!!! It was rather strange. I wondered why that was so. I didn't ask Anna but I really wonder if it's because it's the siesta time. We were there after lunch time. It's all blue sky in Pals and it was hot and I think the combination of those and the fact that the town was quiet, we decided not to stay for long. So I don't have much pictures of Pals, you can see them here. 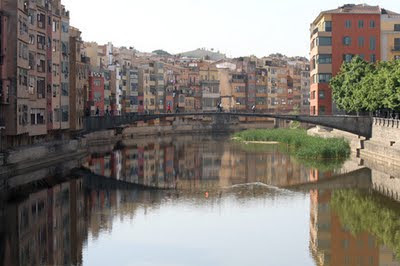 Next stop was to see Costa Brava. Unfortunately when we arrived there, the weather wasn't good. 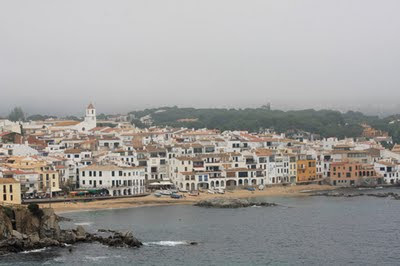 It was misty and rather cold and because Pals was hot, I left my jacket in the car :( But it didn't stop me from having gelato though later on :P The fishing village we stopped in was Calella de Palafrugell and I have to say that even though it was misty and cold, it was really really beautiful there. Again there's not many people around which would have been ideal if the weather had been nicer. I think there weren't many people because there's no sun to enjoy and the water was too cold to swim in. I didn't touch the water though. As we were about to leave, the sky started to clear up :( The blue sky started to appear and the water echoed the its blueness and everything looked really nice and blue. It's very very unfortunate for us. I am sure that it's even more beautiful when the weather was better. To see the pictures that I have, you can go here.